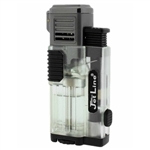 A brand new New York QUAD jet torch lighter with flip top lid, fuel level window and lanyard attachment point. Durable and attractive 4 flames design featuring a state of the art piezo electric quartz crystal ignition system and wind resistant flame. Perfect when on the go; the wind resistant flame is ideal for outside use whether boating, hiking, fishing, the course or just about anywhere the elements command..